Read Tools for School – Avoiding Low Back Pain by Dr. Jacob Robinson to learn more about Absolute Chiropractic and our Chiropractic office in Rio Rancho, NM. As the temperature is peaking at the end of summer so is our children’s excitement as they begin their preparations for the upcoming school year. Each year we head to the stores with a long list of items that will fill a basket full and then be placed very tightly into our children’s school back packs. Unfortunately these over filled backpacks are heading our future generations into early pain and disease processes. According to figures from the U.S. Consumer Product Safety Commission, more than 7,000 children attend the ER each year due to backpack-related injuries. Unfortunately, this is a trend that will continue as more schools remove lockers from their premises, and thus children are forced to carry around with them extra books and bags for the entire day. 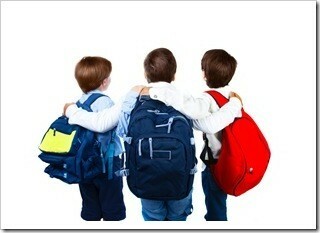 Make sure your child’s backpack weighs no more than 5 to 10 percent of his or her body weight. The backpack will cause your child to begin bending forward in an attempt to support the weight on his or her back rather than on the shoulders, by the straps. A backpack with individualized compartments will help you position the contents most effectively and ensure that your child’s sandwich isn’t flattened by a heavy textbook. When packing the backpack, make sure that pointy or bulky objects are packed away from the area that will rest on the child’s back. An uneven surface rubbing against your child’s back could cause painful blisters. If the backpack is still too heavy, talk with your child’s teacher. It might be possible to leave the heaviest books at school, and bring home only lighter handout materials or work books. Our expert team is trained to diagnose and treat all ages, and can help if you or your children suffer from pain or discomfort from using a backpack. Treatment is geared to the age of the patient, with a more gentle approach for children. We also offer advice on specific exercises that can help you and your family develop stronger muscles, and on proper nutrition, good posture, and optimum sleeping habits. This entry was posted on Tuesday, August 19th, 2014 at 1:35 pm and is filed under Health Articles. You can follow any responses to this entry through the RSS 2.0 feed. You can skip to the end and leave a response. Pinging is currently not allowed.